Sweet, tangy and perfectly spiced. 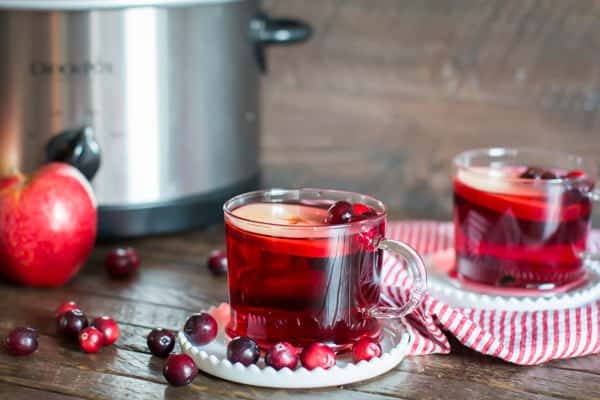 This Slow Cooker Cranberry Apple Cider is perfect for any holiday gathering! I love a good apple cider, though I rarely make it myself. I was sipping on apple cider at World Market the other day, savoring every sip. Wow the things that can make me happy, haha. 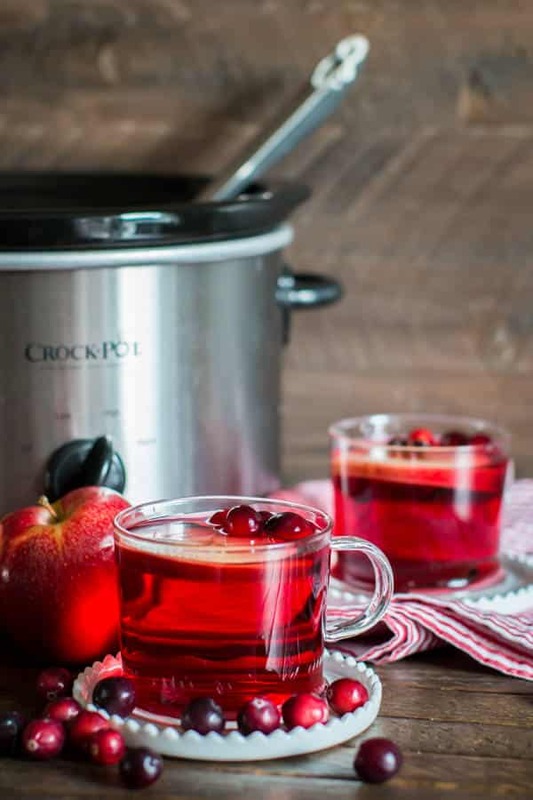 This Slow Cooker Cranberry Apple Cider has so much more flavor than plain apple cider! 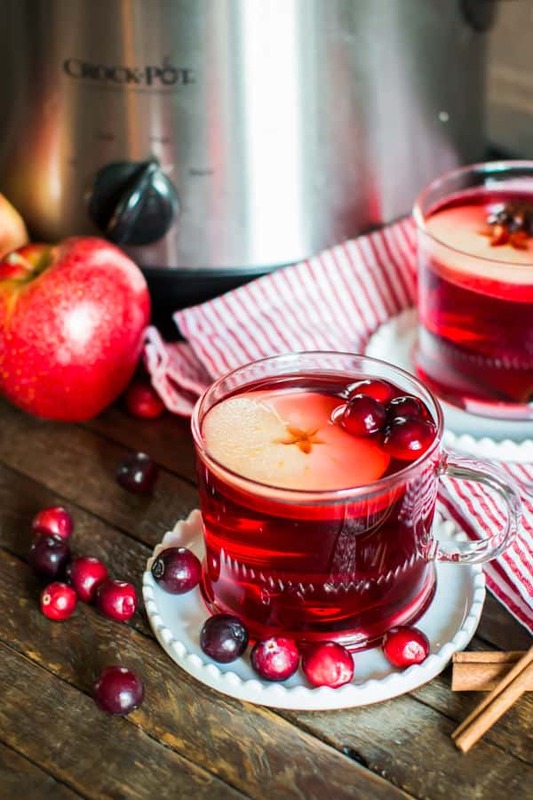 The tanginess from the cranberry and sweetness from the apples is a perfect pair. 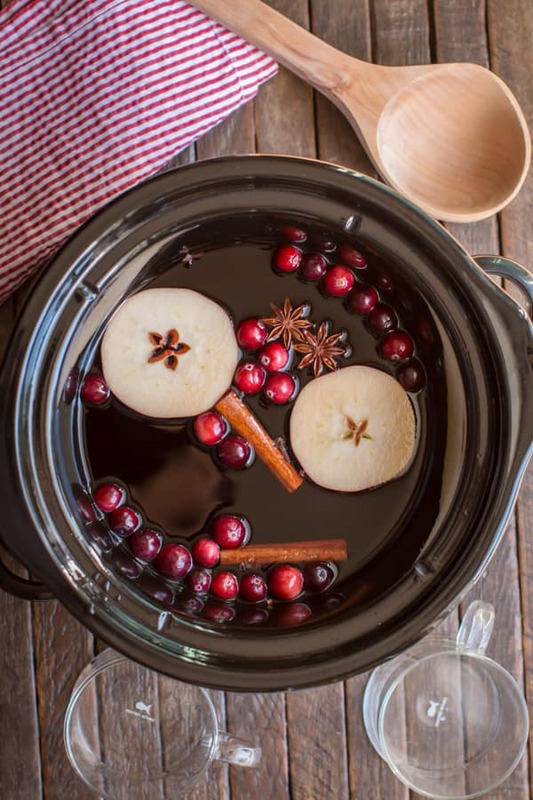 Also the use of whole spices in this cider gives it a unique flavor. I have never used star anise before. You can see the star anise below, it looks like an 8 sided star. It’s slightly licorice tasting, I HATE licorice, but this was really subtle, and tasted good with the clove and cinnamon. Star Anise is one of the flavorings in Chinese Five Spice, which I love! I love the pretty color of this cider! I got out my clear Crate and Barrel mugs and saucers which have been collecting dust. I will be back on Friday with the Vintage Slow Cooker Recipe of the Month! I also have a great fall recipe scheduled for next Monday, so stay tuned! I can’t believe the holidays are just around the corner, I already feel overwhelmed! Have a great week! 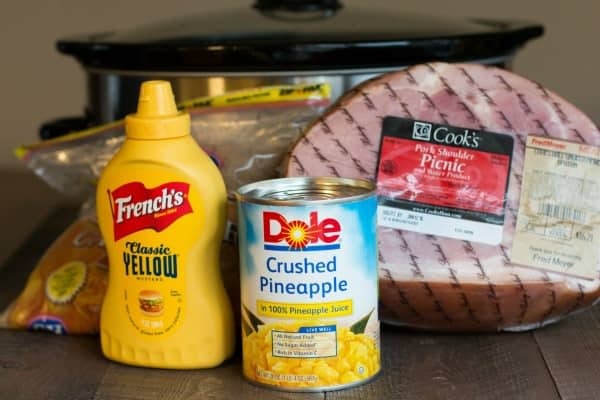 Add everything to a 4 quart or larger slow cooker. Cover and cook on HIGH for 2 hours or until heated. Hi! I’m very interested in this recipe. It sounds delicious. Do you have any suggestions what someone would add to their glass in the way of an alcoholic beverage if they so desired? I would add cranberry vodka! Or maybe green apple. Tried this at a holiday staff party and it was a hit. 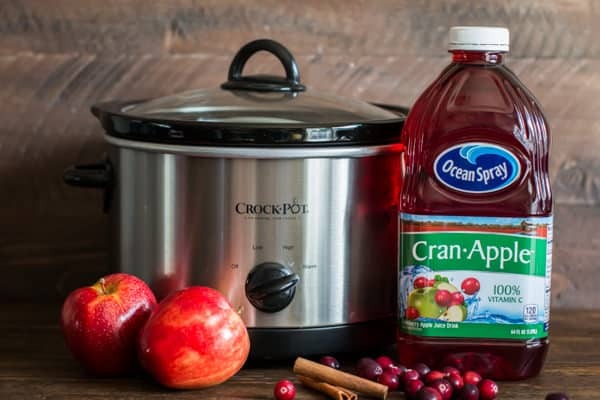 Not a fan of cranberry juice, but with these spices it was very delicious. Time to make another batch so there will be some to share with my family. Yummers! Hi! 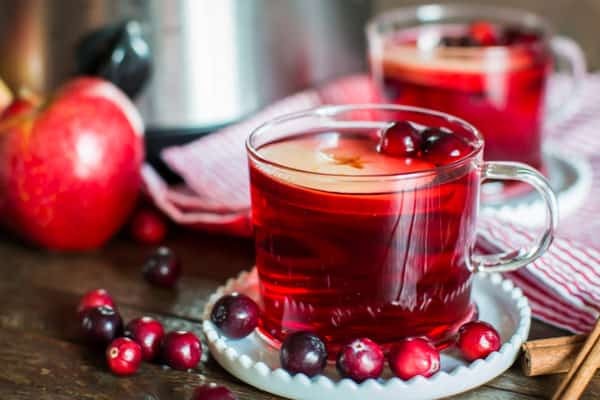 There are cranberries in the picture, but the instructions don’t seem to specify when the cranberries were added. What would you suggest? Thanks. 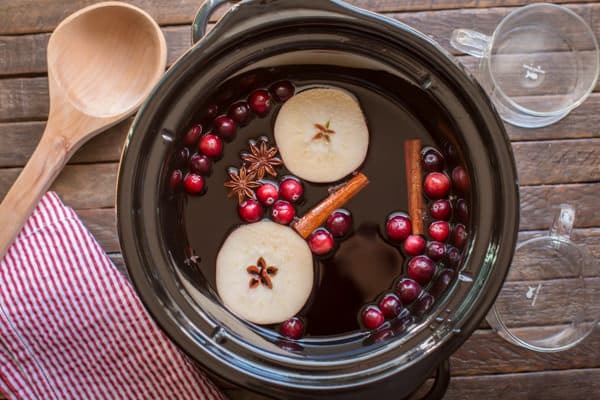 Hi Heather, I used a half cup, I add them at the beginning.It’s not an important ingredient in the recipe, I used them to make the cider look pretty. Thank you for letting me know. I added it to the recipe card. Should you add the vodka prior to heating or after to the cider? After. And don’t let the cider get too hot or it will cook the alcohol off. Do you drink this hot or cold? Hot :). But cold later would be good too.